Now it’s no surprise that Little Italy at Ganeshkhind, off Model Colony, has been dishing out one of the best Italian fares in the city for the last 28 years. But here’s the great news. The restaurant has recently revamped their menu and here’s why you should not be missing it. About three months ago, Little Italy added a plethora of contemporary dishes with subtle twists and a whole new burst of flavours. 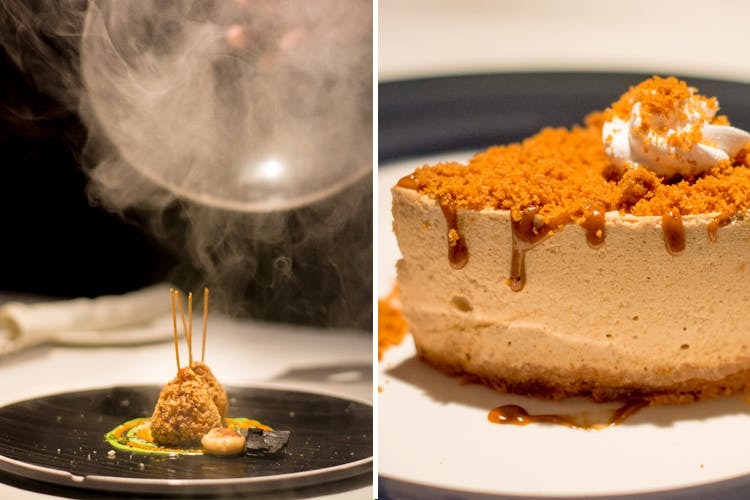 We tried some of their recent creations from the upgraded carte and here’s what we loved. For the first course, we ordered the ravioli crocante – a new entrant to the list of starters, this dish was a delightful presentation of fried ravioli stuffed with roasted peppers and cheese, roasted garlic salsa and spicy tomato dip. Another dish that we thought was absolutely splendid and a must-try during summer was the insalata con pere e noci – an Italian salad comprising sweet pears poached in red wine, caramelized almonds, mesclun, gourmet Parmesan with a tinge of citrus dressing. Speaking of experimental flavours, we recommend you try the cappuccino al funghi selvatici – a beautiful blend of wild mushroom zuppe (read: soup) with pine nut cappuccino and lemon thyme foam. If you love the aroma and taste of roasted coffee beans, this dish must be on your bucket list. A true Italian feast is incomplete without cheesy wood burn pizzas. Our recommendation would be to go for their charcoal pizza or as they call it, pizza bianca e nero. Topped with chilli tossed vegetables, mozzarella, cheddar, ricotta and Parmesan on a charcoal-black base, this pizza was made with perfection in creamy Alfredo (white) sauce. We ended our dinner with the most scrumptious dessert of all time – the lotus cheesecake, made of mascarpone, lotus cookie butter with a slight hint of cinnamon to accentuate the flavours. Vegetarian or not, Little Italy is one of those restaurants in Pune you cannot afford to give a miss.